1 CORINTHIANS 10:13 KJV "There hath no temptation taken you but such as is common to man: but God [is] faithful, who will not..."
10Neither murmur ye, as some of them also murmured, and were destroyed of the destroyer. 11Now all these things happened unto them for ensamples: and they are written for our admonition, upon whom the ends of the world are come. 12Wherefore let him that thinketh he standeth take heed lest he fall. 13There hath no temptation taken you but such as is common to man: but God is faithful, who will not suffer you to be tempted above that ye are able; but will with the temptation also make a way to escape, that ye may be able to bear it. 14Wherefore, my dearly beloved, flee from idolatry. 15I speak as to wise men; judge ye what I say. 16The cup of blessing which we bless, is it not the communion of the blood of Christ? The bread which we break, is it not the communion of the body of Christ? There hath no temptation taken you, but such as is common to man: but God is faithfull, who wil not suffer you to bee tempted aboue that you are able: but will with the temptation also make a way to escape, that ye may bee able to beare it. Temptacioun take `not you, but mannus temptacioun; for God is trewe, which schal not suffre you to be temptid aboue that that ye moun; but he schal make with temptacioun also purueyaunce, that ye moun suffre. 10:13 Common to man - Or, as the Greek word imports, proportioned to human strength. God is faithful - In giving the help which he hath promised. And he will with the temptation - Provide for your deliverance. 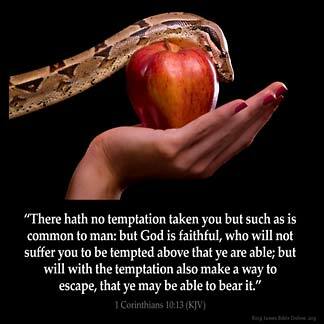 1Co 10:13 There hath no temptation taken you but such as is common to man. Perhaps the Corinthians thought their temptations were usually severe, but these were only what human nature is exposed to. But God [is] faithful. Will keep every promise, and hence will not suffer you to be tempted above that ye are able. Will give them strength and deliverance in every temptation if they trust in him. None who devoutly follow Christ, who pray constantly for strength, and trust God, will fall. Satan the tempter,is not omnipotent,omniscient,or omniptesent. While he tempts or tries us daily in various ways never relenting. Thank GOD that he is on a leash! Greater is He that is in me than he that is in the world. Amen. The scriptures do not teach that God tempts us. Let God be true but every man a liar. This scripture taken in context means if we are enticed by our own desires, and are led by them into sin, God will provide a way out for us. He does not want us to sin, but reassures us that when we do, there is forgiveness for us through his Son our Lord and Saviour Jesus Christ.. We have died to sin, how can we live in it any longer? Sin is very enjoyable that is the reason we sin! We like it! But, when we get tired of it there is a way to escape,look for the exit. The bible is right. I believe there is a significant difference in how God understands us and how we understand ourselves. The association of thinking we fully understand what we can or cannot bear as to temptation, personal tragedy or any other aspect of our lives that seems impossible to deal with, may be directly in contrast to how God sees it such as noted in Isaiah 55 as to his thoughts and ours . As we become more intimate with God we begin to better understand ourselves and where we stand in Christ. To Tina, yes God will put more on you than you can bare, if you are not a Christian. If you are not a Christian, then it is entirely possible to have more than you can bare to be put on you. Even then God is waiting on the side lines for you to accept Jesus as your Savior, as way of escape. what a reviving scripture! I think God is the only way out of any given terror.